Mazda keeps tweaking the recipe for its CX-3 subcompact crossover SUV. The dashes of this and pinches of that for 2019 include a tiny bump in horsepower, subtle exterior alterations, and some reconfiguring of the interior. Left unchanged are the little ute’s agile handling, premium interior touches in top-trim models—and, unfortunately, constrained cargo and rear-seat space. Grand Touring models come standard with 18-inch wheels, a sunroof, LED exterior lighting, a roof-mounted “shark fin” antenna, and heated power mirrors with integrated turn signals. Thick rear roof pillars compromise the view to the rear corners, though the standard blind-spot monitoring and rear cross-traffic alert help. In its most expensive form—an all-wheel-drive Grand Touring like the one that Consumer Guide tested—the CX-3 still manages to appear reasonably priced. The starting tab with delivery is $28,140, which is a $785 increase from the 2018 price. The CX-3’s interior has a more premium look and feel than most class competitors–particularly in Grand Touring trim. 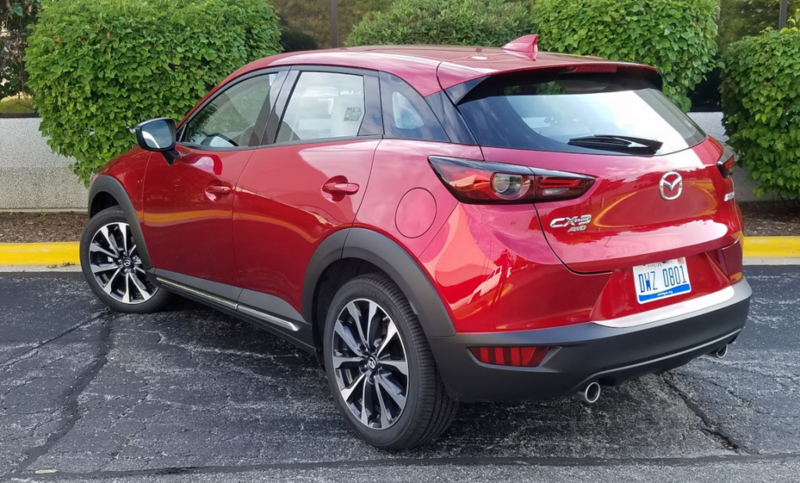 The CX-3 engine remains a naturally aspirated 2.0-liter 4-cylinder, but it’s now rated at 148 horsepower at 6000 rpm, a gain of just two ponies—though Mazda claims to have made other changes that improve torque delivery, if not output. 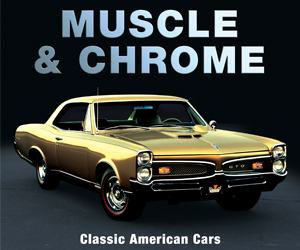 (Peak torque remains 146 lb-ft of torque at 2800 rpm.) This powerplant is still joined to a 6-speed automatic with manual-shift capability and selectable “Sport” mode. CG testers give this powerteam its props for somewhat perky off-the-line go, but it had to work hard to cruise the highway, and it did so with some noisy protest. Sport delays upshifts to extract a little more power for passing and merging (or a little livelier green-light punch in town) but running in it for long stretches poses a threat to fuel economy. 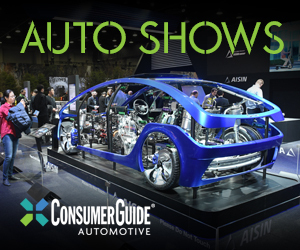 The EPA projects an AWD Grand Touring at 27 mpg in the city and 32 mpg on the highway, and with 64 percent of our combined driving in city conditions, the test vehicle returned 26.45 mpg. A 2.0-liter 4-cylinder engine paired with a 6-speed automatic transmission is standard in all CX-3s. For 2019, the horsepower rating is bumped up by two, for a total of 148. Standard wheel cladding gives the CX-3 a more rugged look. Inside, an electronic parking brake replaces a traditional mechanical lever-activated brake. 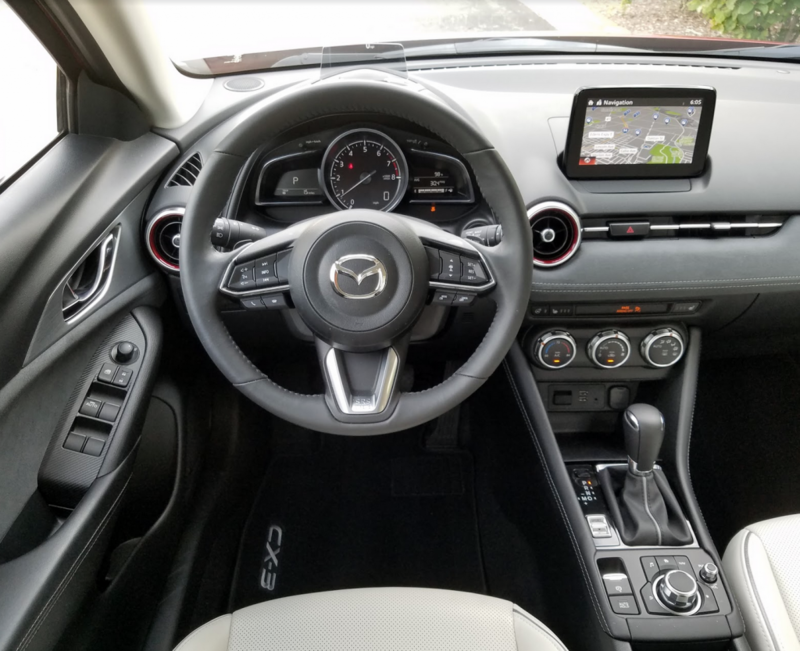 That change allows for a slight redo of the center console—but there’s still soft padding along the upper edges of the console, a nice touch that not even every luxury-grade car or SUV displays. Front seats have been reshaped to a degree to heighten comfort. The little ute paints itself over the rises and falls of road surfaces, but pavement cracks sometimes are met by a pronounced rear-end hop. Steering has an acceptable level of feel, and responds well to driver inputs. Cornering lean isn’t excessive—standard “G-Vectoring Control” subtly adjusts power delivery during cornering—and braking is predictable. Passenger room is pretty good for a subcompact vehicle if you’re sitting up front. That’s decidedly less true in the second row. Rear headroom also suffers a little to accommodate the sloping roof that gives the CX-3 its sportier-than-usual looks. There’s enough room in the small cargo bay for a week’s groceries for two but more substantial loads will require lowering the 60/40-split rear seats. At least they fold almost flat with an uninterrupted transition from the cargo floor. Also, the load-floor panel can be removed to increase capacity a bit, or it can serve to conceal small items that owners might want to keep out of sight. Driving controls consist of a large analog speedometer dial flanked by oblong windows with additional vehicle information. The Mazda Connect infotainment system is governed by the console-mounted “Commander Control” knob. While not nearly the most confounding of such arrangements, it still complicates certain functions like making audio selections. The automatic climate-control system features three convenient dials. The glove box is usefully large, but not all other personal-item storage is as helpful. Even after the change to the console the cup holders are essentially inaccessible when the center armrest is down. The rear row gains a pull-down center armrest with twin cup holders. Other Grand Touring standards include perforated-leather seats, heated front seats, leather-wrapped steering wheel and shifter knob, a head-up display that doesn’t wash out when viewed through polarized sunglasses, a power moonroof, upgraded exterior lighting, heated exterior mirrors, cargo-compartment cover, sunglasses holder, navigation, 7-speaker Bose audio with satellite and HD radio, Bluetooth connectivity, voice-command capability, 7-inch color touchscreen, push-button starting, blind-spot monitoring, rear cross-traffic alert, and advanced keyless entry. The 2019 CX-3 will ably serve singletons, empty-nesters, or families with a young child or two who like a little bit of style for a livable price. 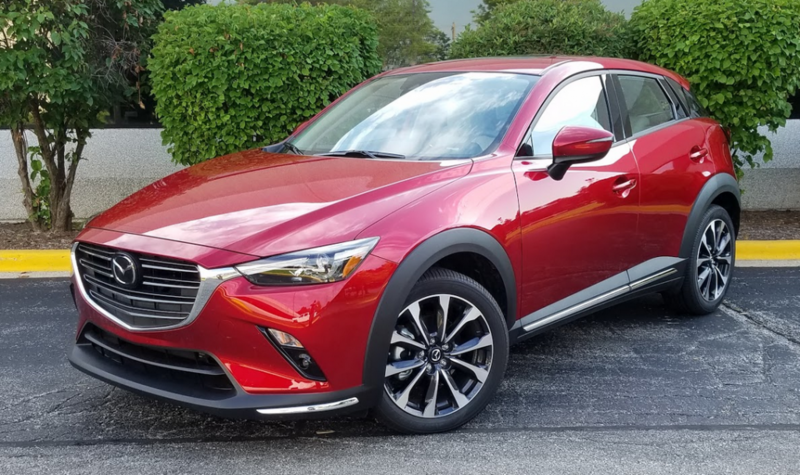 The Mazda CX-3 is probably the most dynamically satisfying subcompact SUV, but its passenger- and cargo-hauling capability comes up short compared to its class rivals. Written by: The Daily Drive staff on October 5, 2018.